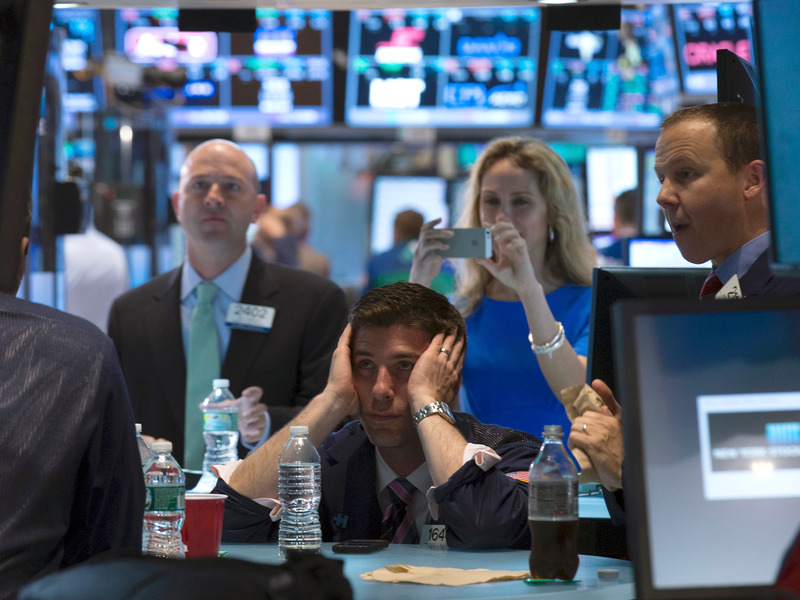 Wall Street should be braced for an economic recession that arrives sooner than is currently expected, according to strategists at Societe Generale. Their concern is driven by the data they're tracking on credit conditions, as well as a proprietary index that has led previous contractions. Strategists at Societe Generale suspect the next recession will arrive sooner than everyone thinks. In fact, they're so perplexed by the data they're seeing that they say it's time to rethink how Wall Street forecasts recessions. "As the current cycle has been unusually long, investors seem to take it for granted that there can always be another extension," a team of strategists including Arthur van Slooten said in a note to clients. He continued: "Over the past three years, recessions forecasts were typically made 'for the next year' only to be shifted out again. Maybe 2019 is the year that we should wake up to the possibility that the next recession could be closer than initially thought." The second, less-known warning sign is their proprietary newsflow indicator. It's based on a count of news articles discussing economic strength as a percentage of all stories. It weakens as bearish media coverage increases, and is used as a leading indicator of growth. Both indicators are illustrated in the chart below. 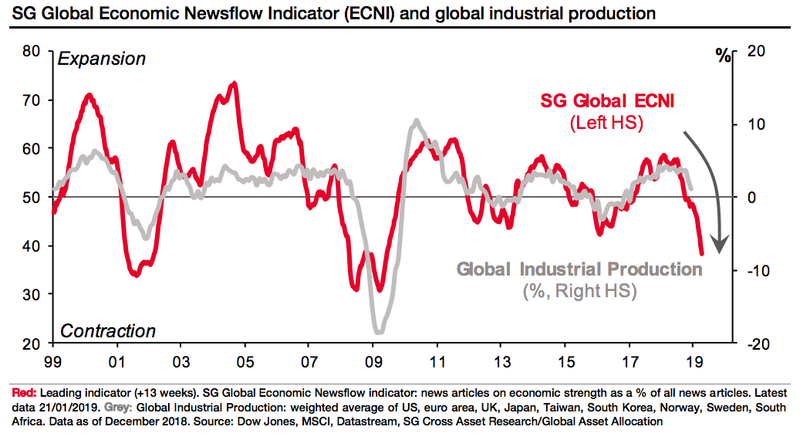 One reason why the newsflow has been more bearish is the slowdown in global industrial production, partly driven by the US-China trade conflict. 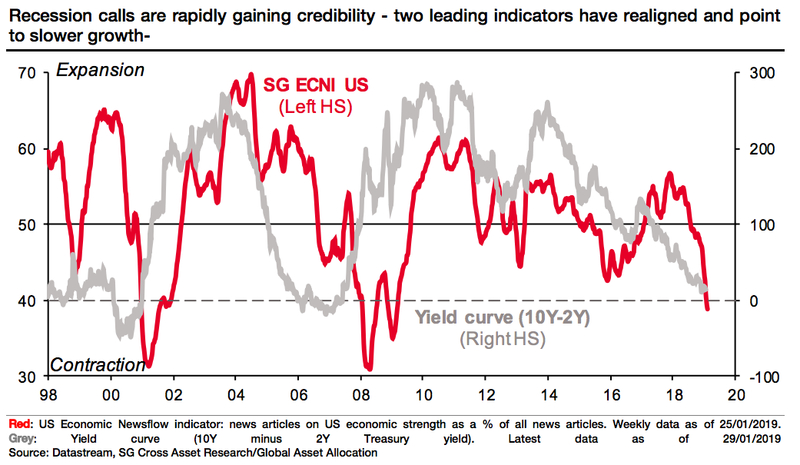 SocGen compared its proprietary indicator to global and US industrial production, and arrived at similarly bearish conclusions. The chart below shows that gloomy coverage of the global economy has generally tracked production, and has led most of the contractions that have occurred since the late 1990s. 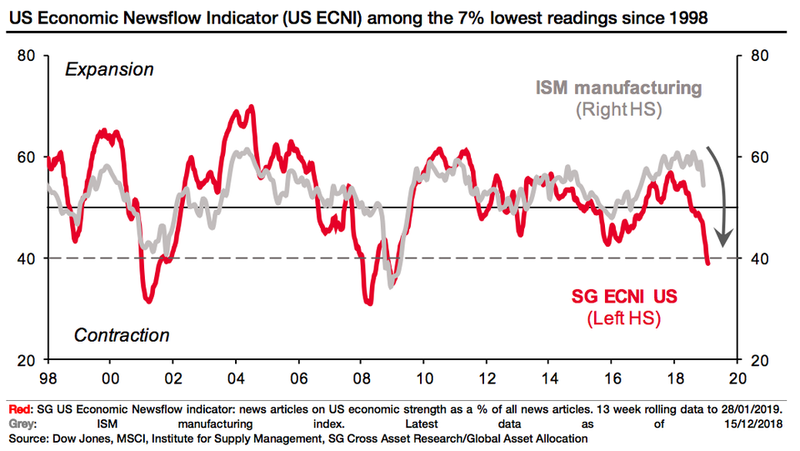 Keeping it US specific, SocGen's newsflow indicator appears to be front-running a contraction in manufacturing output, as measured by the Institute for Supply Management's Purchasing Managers' Index. The ongoing rebound in stocks seems to run counter to the idea that a recession is fast approaching. After all, the sell-off ensued late last year because investors were worried about two blows to their portfolios: a slowdown in economic (and subsequently profit) growth, and a Federal Reserve that did not pause its rate hikes. Stocks have recovered this year following assurances from the Fed that it's going to be attentive to markets. But van Slooten is not convinced that the Fed can create a fertile environment in which financial conditions are neither too hot nor too cold. "While the Fed using its right to be patient has already provided ground for a sharp recovery in equity markets (up 16.4% since the lows in December, the sharpest market recovery since 2010), this is not the return of Goldilocks," he said. He added that the Fed's more dovish stance should at least cast doubt on how the end of this cycle will unfold. "In our view, profit warnings, defaults and increased volatility are likely to be the dominant themes in the next 12 months," van Slooten said. "That may be favourable for Treasuries but not necessarily for credit, equity or the US dollar." While Fed policy matters to investors' portfolios, it's far from the only consideration. That's why some other strategists are not worried about an imminent recession. Like SocGen, the chief investment office at UBS is on recession watch - just not with the same apparent sense of immediacy. In a recent note, UBS laid out some reasons for concern. For example, the New York Federal Reserve's recession probability indicator, which is based on the 3-month/10-year yield curve - is at its highest level since 2008. Yet, the firm contended that the yield curve may not be a reliable precursor of recession this time around. "Looking at the statistics, the number one way a US yield curve inversion can hurt your portfolio is if it makes you reflexively sell stocks," UBS strategist Vincent Heaney said. "History shows that, on average since 1960, after an inversion of the 2y/10y yield curve the S&P 500 returns 29% before it peaks." Even the ISM manufacturing index that van Slooten cites is not a perfect indicator. It sure has contracted during every recession since the 1980s, and even hinted at two of the three. But there have been many contractions - including one as recently as 2016 - that were not promptly followed by recessions. Regardless of which camp you're in, it's clear that Wall Street is warming up to the arrival of the next recession. Van Slooten and his colleagues just aren't convinced that the good times will last for much longer.